Cryospheric Sciences | Image of the Week – Antarctic fieldwork 50 years ago! 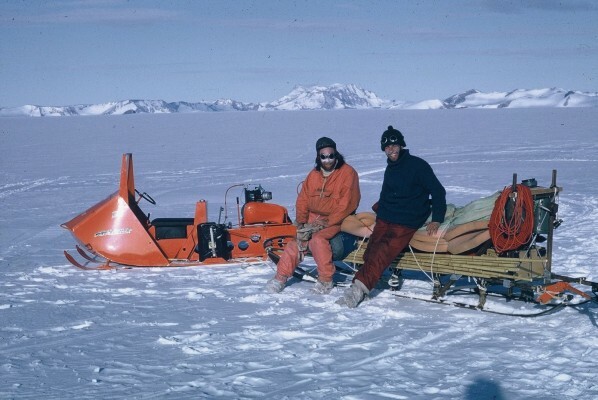 EGU Blogs » Divisions » Cryospheric Sciences » Image of the Week – Antarctic fieldwork 50 years ago! Image of the Week – Antarctic fieldwork 50 years ago! 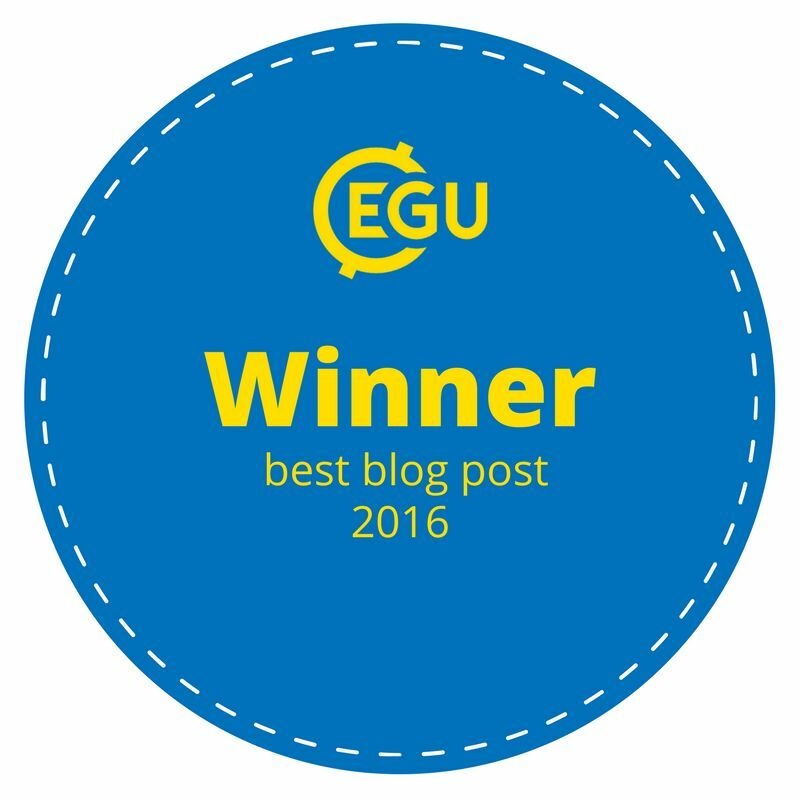 So far this blog has published many pictures of current polar field work campaigns. Today, we would like to take you back to Antarctic expeditions during the 1960s. The photos presented in this post date back from the Belgian-Dutch Antarctic field campaigns of 1964-1966. The first picture shows Ken Blaiklock (red overalls) with a Belgian surveyor. Ken was part of the 1955–58 Commonwealth Trans-Antarctic Expedition – completing the first overland Antarctic crossing via the south pole. This shot was taken during the 1964-1965 summer campaign, as they were surveying the displacement of glaciers in the Sør Rondane Mountains, East Antarctica. At that time, the men had to leave the base station for three weeks with two dog-sled pulled by a small skidoo-like vehicle. Remarkably, this shot doesn’t look too dissimilar to many field campaigns today, where the same type of sledges are still used and the clothing worn is also very similar. However, logistical support was very different, with no technicians or field guides those who were part of the polar expeditions of 50 years ago had to be experts at everything! The second picture illustrates how precise positions (and relative displacements) were measured at that time. No fancy GPS technology, but a network of markers and theodolites. 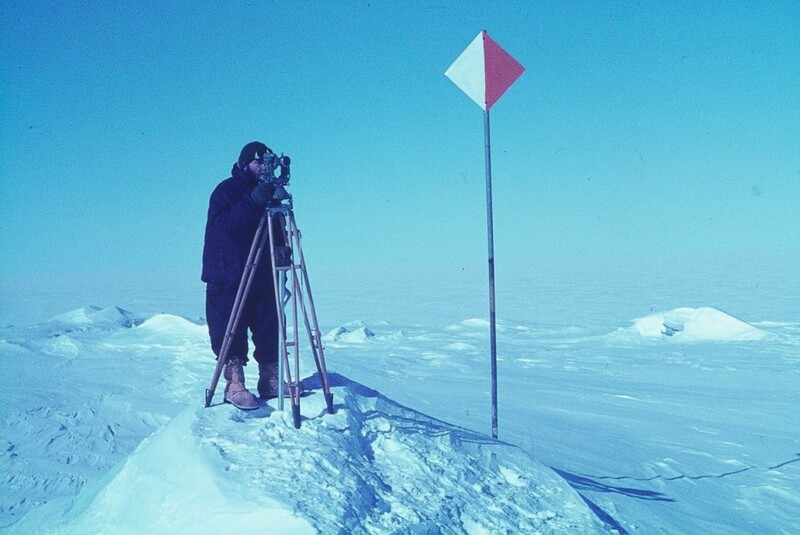 The shot was taken on a pinning point, close to the front of the Roi Baudouin Ice shelf, during the overwintering campaign of 1965 (where people had to stay in Antarctica for 15 months).